Renting a Dumpster in Nashville? Call Discount Dumpster! Discount Dumpster Rental Nashville services all surrounding suburbs so that no job is to far or to close. With a large fleet of roll off dumpsters commercial jobs and residential jobs may be tackled with ease. When looking to remodel a home, complete a fix and flip, or just redo the kitchen a Nashville dumpster rental will help complete the task. If you live in Nashville, TN and would like to rent a roll off dumpster there are two easy ways to do so. You are able to visit our contact page to fill out the form. One of our staff members will contact you shortly to finalize the order. The second option is to call our office where an educated staff member will walk you through which Nashville dumpster rental size will work best for your project. A 12 yard dumpster rental is commonly used for residential projects. These projects range from a bathroom remodel to yard debris cleanup. The small dumpster fits into tight spaces and is commonly placed on driveways. The 20 yard dumpster is ideal for residential and commercial projects. With the four-foot side walls and 22 foot length disposing of material is easy. Each dumpster comes equipped with a large door at the rear of the dumpster. Choose whether to throw trash over the top or walk the heavier material in. The versatility and size of the 30 yard dumpster makes this our most commonly rented roll off dumpster. The 30 yard Nashville dumpster rental is equipped for fix and flips, remodel jobs, demolition, roofing, and much more. If you have a large project on your hands the 30 yard dumpster will work well. Rent a roll off dumpster in Nashville, Tennessee with us today. We offer a wide range of dumpster sizes and services to fit your disposal needs. At Discount Dumpster, we strive to exceed your expectations for your upcoming dumpster rental requirement. The size of roll off container you rent depends on the size of project you have at hand. Not sure where to start? Call us anytime to learn more. All dumpsters come with weight requirements as well. When you are ready to start your next project keep Discount Dumpster rental Nashville in mind. With top tier customer service, you can feel comfortable speaking with a company you can trust. With years of experience servicing dumpster rentals, we will help choose the right Nashville dumpster rental. Family owned and run we are unlike the big guys. We answer every call, or call back right away. No problem is too big or small for Discount Dumpster rental Nashville. What size dumpster rental will I need? 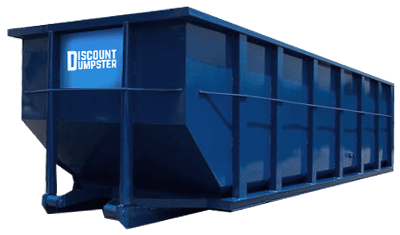 Dumpster Discount offers a range of sizes, starting from 10 yard dumpsters up to 40 yard dumpsters. Most commonly used in the Nashville area are 12-, 20-, or 30-yard containers. 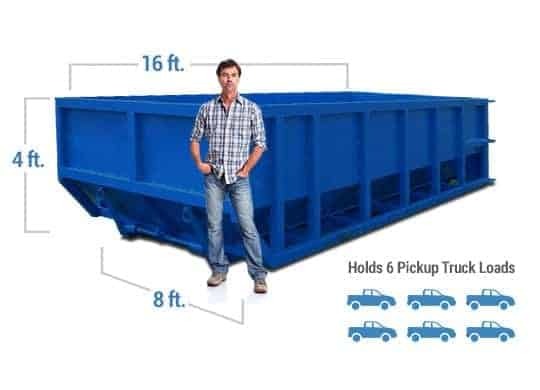 To keep things simple, we compare the size of our containers to how many pickup truck loads would fit into one. For example, a 20-yard container can hold up to eight pickup loads of trash and debris. That is quite a bit! When cleaning out a garage or landscaping the yard, you may only need a 12-yard roll-off dumpster. But for remodeling a kitchen with a lot of cabinets and flooring, you may need a 20-yard container. Our staff can help you determine what size of dumpster rental in Nashville would best fit your needs, so give us a call today. Do I need a permit for my dumpster rental in Nashville? Dumpster Discount Rental in Nashville will accommodate your dumpster needs. We deal with permits on a daily basis and know the requirements for where dumpsters can be placed and for how long. We also handle the permit process and do any legwork for you, so you don’t have to. Permitting can be confusing and frustrating to the first time user. We take the guesswork out of it! We typically recommend that you place your dumpster rental on private property to avoid having to go through the permitting process. If you live in an HOA, you may need to receive approval from the HOA before renting a dumpster. We handle dumpster rentals for all of Nashville and the surrounding area. Be sure to let us know just what you need the dumpster for and we’ll prepare a quote for you including the size and length of time you’ll need it. We’re flexible, too. Need an extra day or two? Just let us know.